Samsung ATIV S Neo with Windows Phone 8 (view larger). 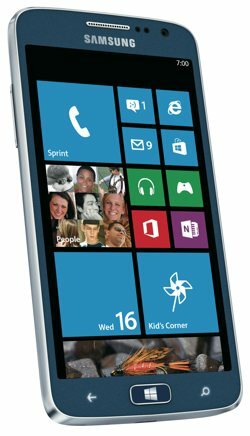 Delivering an enhanced social, multimedia and business experience at an affordable price, the Samsung ATIV S Neo for Sprint runs the Windows Phone 8 operating system, providing seamless integration no matter if it's work or play. You'll be constantly updated with the things and people you care about through Live Tiles and People Hub. Edit documents on the go with Microsoft Office Mobile. Upload them to SkyDrive cloud storage and even play Xbox Live. Make your phone as unique as you are. Running on Sprint's 4G LTE network, the ATIV S Neo also includes access to the optional Sprint TV and Movies with more than 15 channels of live sports, live breaking news and full episodes of the most popular daytime, primetime and kids entertainment. And with Sprint Music Plus, you'll have a full-featured music store right on your phone for purchasing music tracks, ringtones and ringback tones, including millions of DRM-free music tracks and tones updated daily. The ATIV S Neo features a 1.4 GHz dual-core processor, 4.8-inch high-definition display, an 8-megapixel main camera with LED flash, a front-facing 1.9-megapixel camera for video chat, and 16 GB of storage. You can expand its memory via optional microSD memory cards (up to 64 GB in size). This Wi-Fi-enabled smartphone can also act as a hotspot, enabling you to share your 4G LTE connection with up to 8 other Wi-Fi-enabled devices (including tablets, PCs, and MP3 players). The Samsung ATIV S Neo gives business users the flexibility to work on the large HD screen with seamless integration and access to Outlook and Microsoft 365 making it easier to work on-the-go and more efficiently. The ATIV S Neo makes syncing documents between devices (phone, laptop, tablet) simple and easy. Access, create, edit, and share Word, Excel and PowerPoint documents on the go, wherever you need to go, whatever you need to do. Microsoft Office 365 offered by Sprint is available for small and mid-sized businesses. It includes Sprintâ€™s unique Carefree Cloud migration and onboarding assistance, end-user level support, predictable monthly costs with no up-front infrastructure expenses, pay-as-you-go plans, savings by bundling all of the necessary tools, and advanced options to simplify management further, all with a single bill and single point of contact. Your ATIV S Neo has ATIV Beam, so you can share files with other NFC-enabled phones by simply tapping them together. It's a fast and spontaneous way to share your photos, music, contacts and even websites. Or store and access your music, videos, photos and files on cloud storageÂ â€”Â it's never been faster or easier to share. With the press of a button, you can take beautiful pictures with the 8-megapixal rear-facing camera. Or video chat with friends using the front-facing camera. Set your phone to automatically back up every photo and video, keeping your memories safe and snug in the cloud. Experience ultra-fast downloads and smooth, clear graphics while gaming or watching videos. Check email while downloading a movie and listen to music while playing a gameÂ â€”Â multi-tasking is a breeze, thanks to a 1.4 GHz dual-core processor and 4G LTE speed. This next-generation Sprint 4G LTE network will power blazing fast data speeds so you can email, browse, surf, download, stream, and share files faster than standard mobile broadband connections. Sprint's 4G LTE network is currently live in 88 markets across the U.S. (as of May, 2013) with more than 170 additional markets to be added in the coming months. With Sprint's 4G LTE network, you can expect average data download speeds of 6-8 megabits per second (Mbps) and 2-3 Mbps on the uplink in real-world, loaded network environments. When connected to Sprint's 4G LTE network, you'll be able to download a favorite song, picture, sitcom or large video in seconds -- not minutes -- as well as watch live, high-definition streaming video on the go. Additionally, businesses can benefit from the fast connectivity speeds of 4G LTE, from real estate agents conducting virtual property tours to construction teams in the field sharing schematics with engineers online to photojournalists uploading images directly to the newsroom. In conjunction with the move to 4G LTE, Sprint is enhancing its nationwide 3G network that's designed to increase capacity and give you a more reliable connection to voice and data services. That means you stay connected with fewer dropped calls. Expanded 3G coverage will ensure that you have service virtually wherever you need it -- including stronger indoor signals. Your Windows Phone comes alive with the things you care about -- people, places, songs, photos, and apps. It's as personal and unique as you are, with Live Tiles for the people you care about and the apps you use all the time. And it works with Windows so you can access your documents and pictures from virtually anywhere via SkyDrive. Here's just a sampling of what Windows 8 Phone is all about. 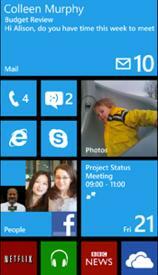 Live Tiles and Apps. You can pin people, apps, songs, Web sites, directions, games, photos, docs, and more to your Start Screen, and get real-time updates on everything you care about. People Hub. Your Facebook, Outlook, LinkedIn, Twitter, Skype, and other contacts are accessible in People Hub. Instantly call, text, email or contact them using Skype all from the same place. Rooms. An invitation-only place from where you can privately share a calendar, photo album, group chat, and notes with other room members. SkyDrive. With SkyDrive all your photos, Word docs, Excel spread sheets and PowerPoint presentations are backed up and accessible virtually everywhere. SkyDrive comes with 7 GB of free storage space. Office and Email. The Office Hub is your go-to spot for Microsoft Word Mobile, PowerPoint Mobile, and Excel Mobile. And your email is clutter free, with multiple accounts (Outlook.com, Hotmail, Google Mail) in one Linked Inbox. Top Level Categories for Samsung ATIV S Neo, Royal Blue 16GB (Sprint).